As with the recent Power Query update (26) you can now create your own MDX and DAX-statements for retrieving data from a cube, it is also possible to pass individual parameters from your Excel-sheet to the queries. This is a prerequisite for dynamically reducing the number of returned fields to the query, thereby allowing a decent performance of these reports. So how about filtering the query by a table that sits in your local Excel file? Can we do an inner-join just like on the SQL-server-source? Not to my knowledge, as the references to the objects involved always need to be within the SSAS-datasource. with “YearNo” being the parameter passed from your Excel file. This way you can dynamically filter single fields or ordered ranges (date from – to). Yep: Do the single parameter filter and transform it into a function that is called for every filter value in your filter-table. Performance will be fine for many cases but of course will decrease with the length of your filter table. But hey: This hasn’t been possible before at all! OK, so now that we’ve managed the filtering: How about the nice formats and quick detailed reports? Show your data in a flat table if you don’t need (sub-)totals. 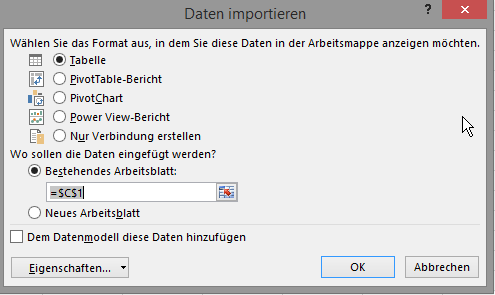 (Don’t be put off by the standard table-layout: You can choose your own layout & make this stick by choosing “Preserve column/sort/layout” and “Preserve cell formatting” in the “External Data Properties” in “Data Range Properties” within the “Table Tools”-“Design” tab). Show your data in a pivot table if you need totals and sub-totals as well. You can drag in as many fields into your row section without any major performance issues (as this is not an MDX/cube-pivot). And you can apply every imaginable number format for your fields in the row section as well. You could also choose some nice charts: Pivot Charts or even Power View reports if you wish. 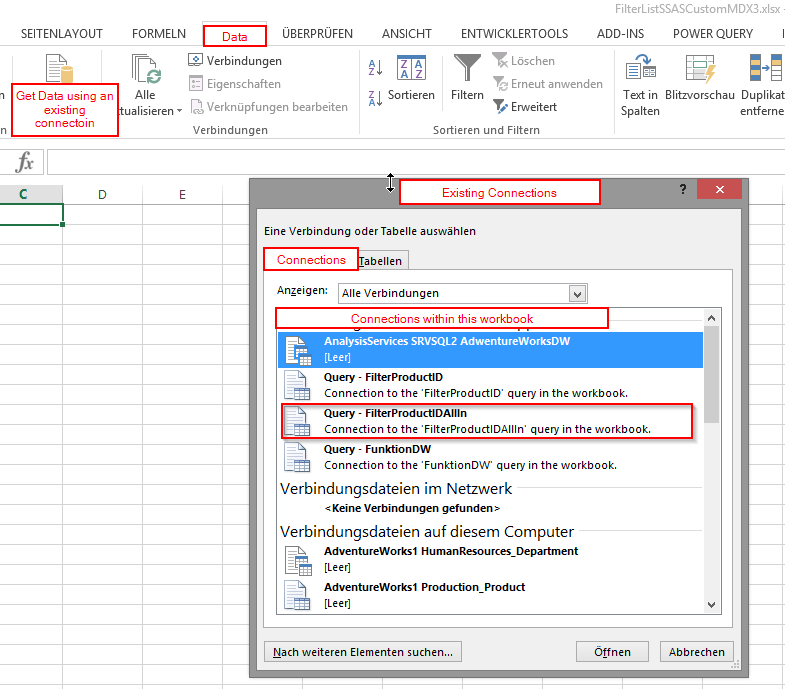 NB1: If for any reason you prefer to use cube-functions in your reports, you simply load your Power Query to the data model and access the results via cube-functions from there. NB2: Although your Power-Pivot data model will be empty, Power Update would update these reports as well, which is also pretty brilliant! Have a look at the code in the FilterListSSASCustomMDX3.xlsx. Edit 2016-Oct-19: Here you can find a very nice solution for dynamic member filters that folds.